Soot particles emitted from Kathmandu brick kilns contribute at least 40 per cent to the Valley’s air pollution in winter, and this is not just a health hazard but also hastens Himalayan glacial melting. Cheaper, cleaner and more energy efficient technologies are available, yet brick factories continue to spew out thick black smoke from their stacks on the city outskirts. “Brick kilns, along with crop fires and vehicle emissions emit soot particles that exacerbate climate change, contribute to glacial melting, affect monsoon rainfall and also cause cardio-pulmonary ailments in people living in Kathmandu,” says Arnico Panday, Senior Atmospheric Scientist at ICIMOD. However, hope is at hand. A recent conference in Godavari showcased cleaner and energy efficient technologies for brick kilns that could reduce air pollution in Kathmandu and lessen the emission of black carbon that cause glaciers to melt. Of the 1,100 or so brick kilns in Nepal, one-third are in Kathmandu Valley. Most use traditional Bull Trench models that are inefficient, energy-intensive and polluting. The improved Vertical Shaft Brick Kiln (VSBK) that burns less coal and emits less smoke is being used in only eight brick factories in Nepal, including two in the Valley. 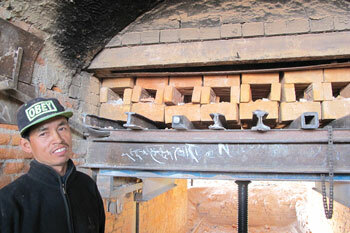 “The shafts burn much less coal much more efficiently so the bricks are ready in 24 hours, and you can see there is very little dust and smoke here,” said supervisor Raj Kumar Lama (pic, above) while showing visitors how clay moulds are loaded into the furnace of the Satyanarayan Brick Kiln in Imadol. Lama is much sought after in Nepal and abroad, having helped build VSBK factories in Afghanistan and Pakistan. Unlike other kilns, clay mould-making here is mechanised so the bricks produced are of standard weight and dimensions. They are then dried in the sun for a week before being loaded into the vertical shafts. Coal bits are loaded in between before the furnace is fired. However, despite the better technology, customers still prefer bricks made from traditional factories because they are redder, and do not crack as easily. VSBK bricks are smoother, and can be used for Rat Trap masonry walls which have better insulation, are sound-proof and lighter because fewer bricks are needed. VSBK factories are more expensive to build, the brick-making needs more water, and factories need to employ workers all year round. VSBK is more mechanised and therefore needs electricity which is in short supply. All this drives up the cost of bricks. Kathmandu’s demand for bricks grows 15 per cent annually, as the construction industry booms. Unless cleaner kilns are used, the Valley’s air is bound to get dirtier. The irony is that Nepali experts like Raj Kumar Lama and Suyesh Prajapati are more in demand abroad than in their own country. Lama says he decided to stay on in Nepal to create jobs here so Nepalis don’t have to migrate. “Everyone wants to go abroad, I am trying to train Nepalis so they stay here and work in pollution-free brick factories,” he says, admitting that many of the brick-makers he has trained are now working in Qatar or Malaysia. Still, Lama is proud that unlike other kilns, there are only Nepali workers in Satyanarayan. The Godavari conference on clean brick kiln last month recommended green certification to influence public procurement so there is demand-side pressure for clean production. Zoning laws should be enforced, and environment-friendly factories rewarded with incentives. It seems we know what needs to be done. We just need to go ahead and do it. The Turkish 726 incident at Kathmandu on Wednesday morning has been attributed to poor visibility on the runway threshold. Many brick kilns are located on the final approach path to the runway in Lalitpur (see map, below) and this makes it difficult for pilots to see the runway. “Brick kilns are making visibility worse, no doubt about it,” confirms Rajesh Chitrakar, an air traffic controller at Tribhuvan International Airport (TIA). The problem has made TIA notorious for flight delays, and airlines lose money burning fuel while on long holding patterns waiting for the visibility to improve. “The visibility is much better during the monsoon when the kilns are not working, and it is really bad in winter when the smoke mixes with the fog,” Chitrakar says. The minimum visibility required for landings at Kathmandu is 1,600m at the threshold of the runway, and most winter mornings it is less than that and the airport has to be closed. On Wednesday, the visibility was 3,000m but there were smog patches to the east of the airfield. 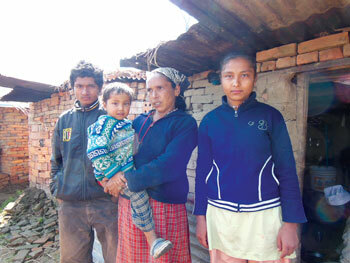 Kiln worker Debaki Adhikari (with baby) from Sindhupalchok shares her temporary hut with her children, including a daughter (in blue) who is preparing for her SLC. Nepal’s brick industry has been under fire for decades for poor labour practices, but more and more kiln owners are under pressure to improve working conditions. Media attention, lobbying by activists and the threat that customers may not buy bricks made by children has goaded some owners to ban workers under 18, set up day care centres, and even pay to send children of working parents to school. Debaki Adhikari is a mother of three from Sindhupalchok who has joined her husband to make clay moulds at the Satyanarayan Brick Factory in Imadol of Lalitpur. The children go to nearby schools, and one daughter is home preparing for her SLC exams next month. Co-worker Jaimali Budhamagar has been coming to Kathmandu from Rolpa every winter for the past 12 years. “My son went to school this morning, he is in Grade 3,” she says proudly. Across the Valley, the Champi Mai Brick Kiln has set up a day care centre for children of workers between the ages of five months to five years where they get three meals a day. The company has enrolled older children in nearby government schools. 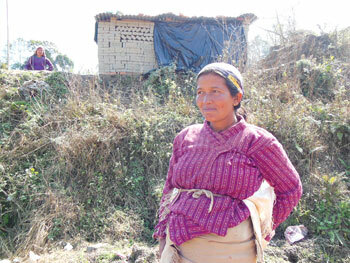 Yam Kumari GC, also from Rolpa, moves to Kathmandu with her family for six months in a year to earn extra income, and she is happy her children can go to school while here. “My daughter goes to school every day, she is really interested in her studies and is doing well in class,” Yam Kumari tells us, looking up from her washing. Champi Mai is one of five kilns which is working with activists from the Better Brick Nepal Program to get a BCN (Brick Clean Network) certification for correct labour practices and environmental standards. Satyanarayan uses the Vertical Shaft Brick Kiln (VSBK) technology, while Champi Mai uses ‘Zig-zag’ kilns, both of which are less polluting than traditional furnaces. At an international conference on brick kiln reform in Godavari last month, Satyanarayan’s owner Chandra Maharjan, said: “Nepal is making progress in eliminating child labour in brick kilns.” Maharjan is also a nominated member of the Constituent Assembly, and is lobbying to legislate labour and environmental safeguards for the brick industry. Yam Kumari GC from Rolpa works in a brick kiln in Kathmandu which pays for her two children to go to a government school nearby.